I admit it. When I was a kid, I sometimes enjoyed seeing my brother get in trouble. He was an easy-going, good-natured big brother. He even tried his hardest to teach me to do backwards somersaults, and I still had the gall to gloat when he got in trouble! I was definitely not born basically good, no matter what the secular psychologists may say. My old sin nature was up and running from the start. If you have children in your household, you have probably seen this phenomena a few times yourself. A child comes running with a report, and it’s obvious that his main motivation is not godly concern for the offender’s soul, but an eagerness to see him get in trouble. Or you’re about to take a child aside for discipline, and you notice, out of the corner of your eye, another child smirking. What does God do when his child rejoices over the fall of an enemy? Even though, under God’s holy justice, that enemy might deserve to be disciplined, the onlooker who rejoices over that discipline also deserves to be disciplined. We are called to love our enemies, and love “does not rejoice at wrongdoing, but rejoices with the truth” (1 Cor. 13:6, ESV). When we rejoice over the failures or punishments of others, we are sinning. Because of this, God sometimes withdraws discipline He would otherwise have brought upon a person who is sinning. Explain that the offender may actually deserve to be disciplined, but that you are choosing to withhold that discipline because of their sinful attitude. Help them see that they are disobeying God with their spiteful attitude. They deserve discipline just as much as the offender does. You may want to have both parties – the child who was going to be disciplined and the child who was gloating – work together memorizing or copying appropriate verses, or have both children serve each other or build each other up in some way. We must also be careful of our example as we discipline our children. We can unwittingly communicate that we are taking delight in disciplining, if we give way to anger or ridicule. In doing so, we not only sin against God and the children, but we display a sinful example before our children. We can minimize the opportunities for children to gloat over each other’s discipline by calmly and lovingly disciplining wrongdoers in private. 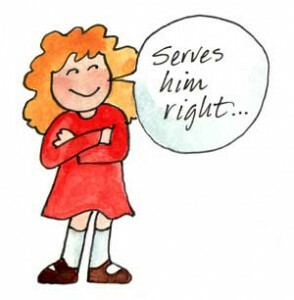 If we make an emotional display of discipline, or if we publicly shame the offender, other children will be more tempted to become involved – either meddling in the situation,defending the wrongdoer and undermining our attempts to discipline, orgloating over the wrongdoer’s impending discipline.